The Keystone State is the king of racing this Saturday, hosting two million-dollar Grade 1 stakes races and a $300,000 Grade 3 event. In total, there are 16 stakes races with at least $100,000 in prize money. Race 9 at PARX is the opening leg of the late $0.50 Pick 4. Let's see if we can get the first three legs with the biggest races of the day. PARX Race 9, the $300,000 GALLANT BOB STAKES is a great betting race with 10 three-year-olds running 6-furlongs on the dirt. Speed, in a BIG WAY plays at the track just outside of Philadelphia. In the 259 dirt, 6-furlong races, 91 of them were won wire-to-wire. Overall, 194 of the winners were either on the lead or considered early speed types. The average winner's position at the quarter pole is 1.7 and 1.3 at the 1/2 mile marker. That might a little too much upfront speed, opening the door for a horse that rates to steal the W late. That's how our handicapper predicts it in our pro-subscribers' bonus commentary, "ENGAGE is making his third start off a layoff. Last time she made three starts, the third was the best. FIRENZE FIRE usually improves nicely in second post-layoff start. Her last, and first off the bench, was good enough. STILL HAVING FUN is another that can improve in her second run after a rest. FORCED is likely to get the jump on the field out of the gate and try to wire 'em. She's a nose away from three wins in three lifetime races." In race 10, we have eight, three-year old fillies running 1 1/16th miles on the dirt for a million-dollars in prize money. Similar to 6-furlongs, speed is still the overriding track bias for the typical winner at 1 1/16th miles. Front-runners and early speed types take home the crown 65% of the 1 1/16th PARX races, with 22% going wire-to-wire. The rail also factors in with 22% winners. This race has an overwhelming morning-line favorite, MONOMOY GIRL (PP: 2) is the oddsmakers' 3/5 pick. While she isn't on the rail, she'll be firing out of the two spot and will likely be on the rail in a second. GIRL and JUMP RULER (PP: 3 ML 20-1) are the only natural front-runners and GIRL is to the inside. Normally, we look for holes in 3/5 types, trying to find a reason for the chalk to choke. 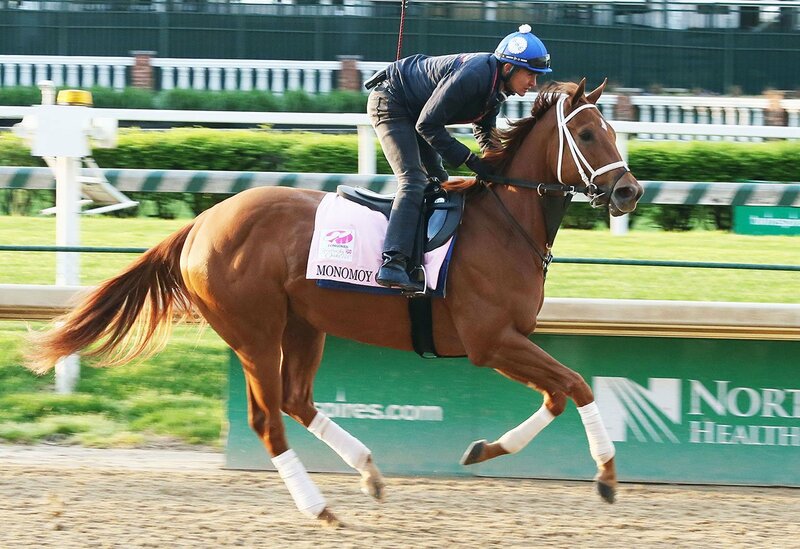 However, MONOMOY GIRL is likely to have her way and be able to control the pace from beginning to end. She might be a single in the Pick 4 ticket. Maybe she finds a challenger at the wire, according to our bonus commentary, "MIDNIGHT BISOU is the one of the few that's likely to challenge the top choice late." The others to consider for your COTILLION STAKES exotic tickets include, "SEPARATIONOFPOWER should rate off the early runners and trainer, Chad Brown, wins at 27% with shippers. JUMP RULER will try to come out of the gate and run with MONOMOY. She's finished in-the-money seven straight races." We wrap up our Saturday Stakes racing review with the PENNSYLVANIA STAKES. It's another good betting affair with 10, three-year-old boys running 1 1/8 miles on the dirt. Unlike the COTILLION STAKES, the DERBY looks like a more competitive group with a lukewarm morning-favorite, MCKINZIE (PP: 8) at 5/2. Although past-performances at the distance are skinny, we still believe speed will likely be a major factor in the outcome. The first turn is going to come quickly and in/near the lead usually isn't a bad place to be in two-turn races. If that's the case, MCKINZIE will be a real threat as he likes the view from just off the front. He'll likely be looking at AXELROD (PP: 6 ML 5-1), MR FREEZE (PP: 7 ML 12-1), and TRIGGER WARNING (PP: 9 ML 20-1) who look like they'll jump out of the gates first. At least three others, including MCKINZIE should be in close pursuit of the early-speed, pace setters. With as many as six horses on/near the front, it could lead to hot early fractions and create the space for a horse to rate and run-down tired legs late. That's how our handicapped sees it, "HOFBURG should be right off the front runners. He's making his first start off the bench and has won both his last two after a rest. MR FREEZE just won the West Virginia Derby by 8 lengths with the best speed figure in the field. MCKINZIE has three wins and a second by 3/4s of a length in four career starts. INSTILLED REGARD trainer, Chad Brown, wins at 29% in first start following a claim." GET OUR FULL CARD PARX PICKS PLUS ALL OTHER TRACKS RUNNING!